Serving the Galactic Empire comes with some murky moral questions: Is the Rebel Alliance really a terrorist organization? Is political stability worth the destruction of an entire planet? Should I serve in a military that doesn't even teach me how to shoot properly? As the short film "Love Wars" reveals, those questions become even more complicated when you're hiding the fact that you're gay. 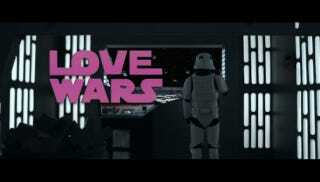 Love Wars could have been nothing more than an amusing trifle, but the filmmakers actually take the time to explore the conflicted feelings of two men who believe in the Empire's cause, but can't take their relationship public. It's also a poignant reminder that, as disposable as they may seem, Stormtroopers aren't all the same under the uniform.